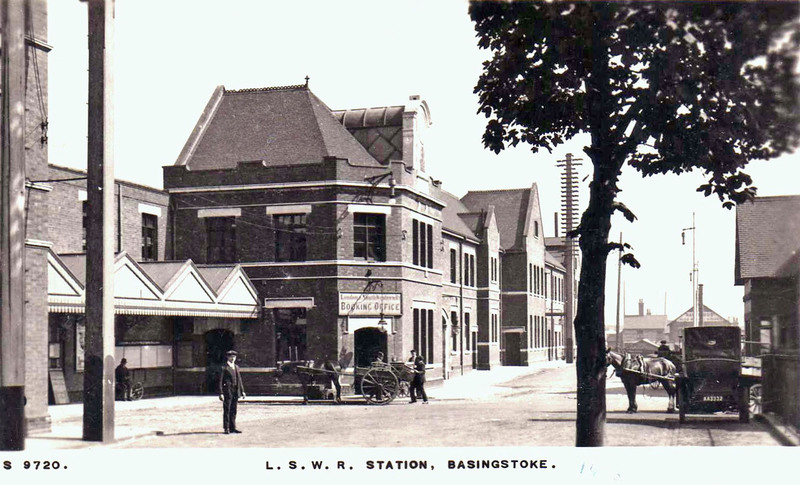 Basingstoke & District Railway Society. The Society was formed in 1974 to provide entertainment on railway related matters. 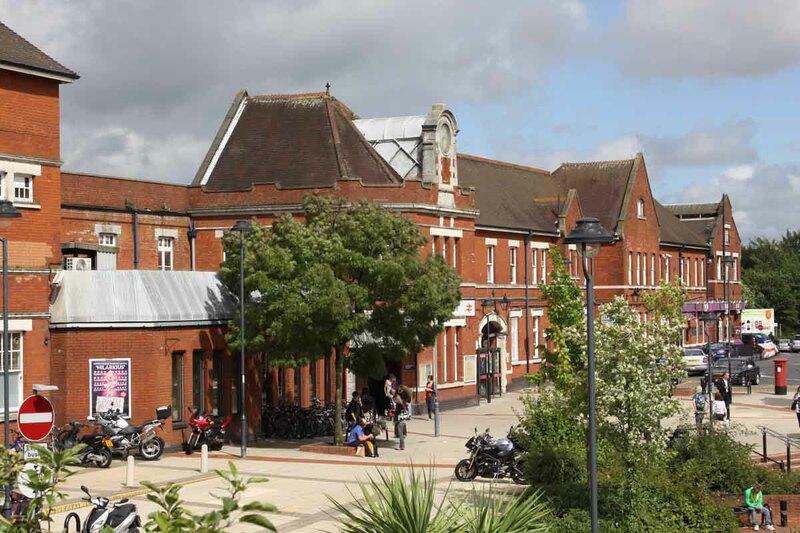 We meet twice monthly on a Wednesday evening between 19.45 and 22.00 at the Wote Street Club in the Basingstoke Town Centre. Our membership number is around 80, male and female, young and old, and our meeting attendance is typically 40. The majority of our meetings take the form of an illustrated presentation by a top quality speaker. Members pay an annual subscription of £5, plus a reduced admission fee of £2 at each meeting and enjoy many other benefits. Visitors are welcome at all our regular meetings on payment of a £3 admission fee. 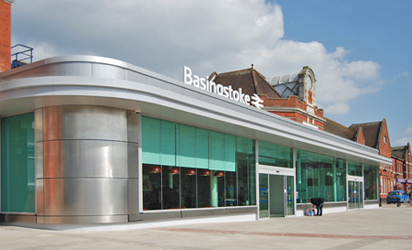 For those historians amongst you, we are pleased to include Chris Tolley's 'A History of the Railways around Basingstoke', accessible from our History page. You can read much more About Us or can Contact Us by using these links or clicking on the tabs above. "I Moved it My Way"
Andrew Goodman, MD of Moveright International, gives a collection of stories and anecdotes, accompanied by slides, of moving large loads over the last 30 years. Robin Mathams is joint curator of the Sutton Coldfield Railway Society's collection of 1900 photographs of British railways taken by Percy Moseley from 1913 to 1970. Tonight's presentation is of his photographs taken between 1937 and 1945, including the few he took during the dark days of WW2. The presentation includes locomotives and trains of all the "Big Four" railway companies. Richard Coghlan, a fairly recent new club member, presents photographs of his almost annual trips to Cuba since 1966. The evening includes digitised slides of the deteriorating railway scene, plus a few museums with working steam, and views of Cuban life. Judy and Chris Rowse use contemporary sources and illustrations to tell the story of two patriotic and well organised railway contractors and their navvies who came to the rescue of the British Army bogged down in the Crimea. In the spring of 1855 they built a line from coast to Sevastopol in just three months. For advanced notice during this year's programme, follow this link. 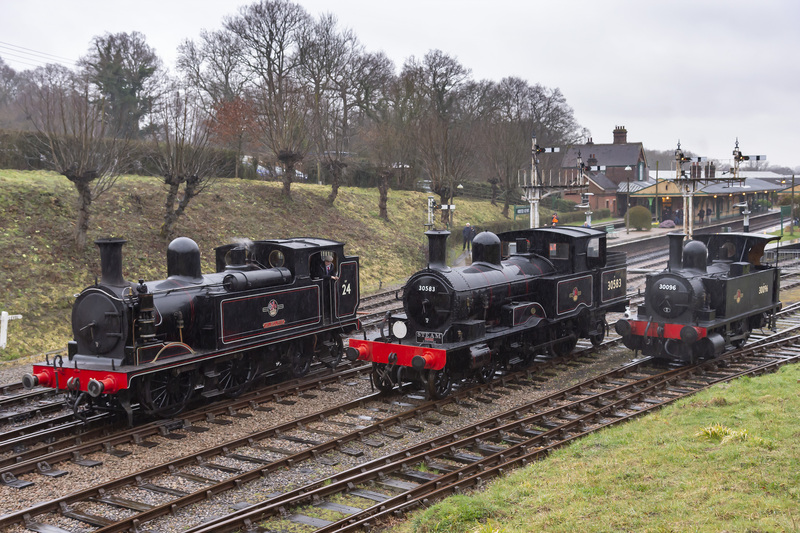 A wet and windy LSWR locomotive lineup at Horsted Keynes during the Bluebell's Branchline Weekend of March 15th-17th 2019.The IOW's 02 0-4-4T No 24 is alongside the recently repainted Adams Radial 4-4-0T No 301583 and B4 0-4-0T No 30096. During the year, a new stock of books donated by Society member Bayard Arriss will be available for sale. Church Street Models, Basingstoke's specialist model shop. Click here for the link to their website. External links to the photographic efforts of current and past society members.